White enamel owl pendant necklace by Kenneth Jay Lane. 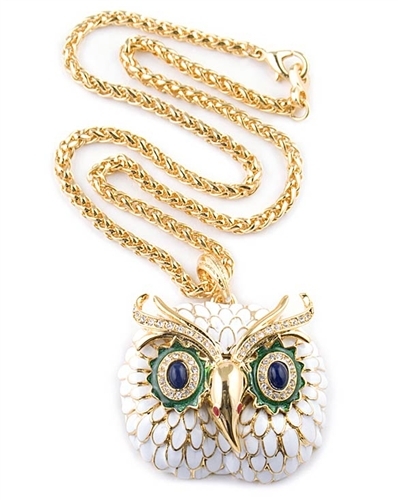 This beautiful designer necklace features a 46x40mm white owl with swarovski crystals. Necklace comes with a chunky gold chain and measures 84cm (30.9") and fastens at back of the neck with a lobster clasp. A cheerful design that will add sparkle to any outfit. Also makes a wonderful gift idea.